Llanfairpwllgwyngyll or Llanfair Pwllgwyngyll (pronounced [ɬanˌvair puɬˈɡwɨ̞nɡɨ̞ɬ]) is a large village and local government community on the island of Anglesey in Wales. It is situated on the Menai Strait next to the Britannia Bridge and across the strait from Bangor. Both shortened (Llanfairpwll or Llanfair PG) and lengthened (Llanfair­pwllgwyngyll­gogery­chwyrn­drobwll­llan­tysilio­gogo­goch) forms of the placename are used in various contexts. At the 2001 census, the population of the community was 3,040 , 76% of whom spoke the Welsh language (Cymraeg) fluently; the highest percentage of speakers were in the 10–14 age group, where 97% spoke Welsh. By the time of the 2011 Census the population had increased to 3,107, of whom 71% were able to speak Welsh. It is the sixth largest settlement on the island by population. The long form of the name, with 58 characters split into 19 syllables, is the longest place name in Europe and the second longest official one-word place name in the world. Although this name is generally stated to have been invented in the 1860s for promotional purposes, a similarly lengthy version was recorded as early as 1849. The Marquess of Anglesey's Column, designed by Thomas Harrison, celebrating the heroism of Henry Paget, 1st Marquess of Anglesey at the Battle of Waterloo. At 27 metres (89 ft) high, it offers views over Anglesey and the Menai Strait. There has been human activity and settlement in the area of the village since the Neolithic era (4000–2000 BC), with subsistence agriculture and fishing the most common occupations for much of its early history. The island of Anglesey was at that point reachable only by boat across the Menai Strait. A largely destroyed, collapsed dolmen can be found from this period in the parish, located at Ty Mawr north of the present-day church; early Ordnance Survey maps show a long cairn on the site. The probable remains of a hillfort, with a fragmentary bank and ditch, were recorded on an outcrop known as Craig y Ddinas. The area was briefly invaded and captured by the Romans under Gaius Suetonius Paulinus, temporarily abandoned in order to consolidate forces against Boudicca, then held until the end of Roman Britain. With the withdrawal of the Roman forces, the area fell under the control of the early medieval Kingdom of Gwynedd. There has probably been a small Christian religious site, perhaps a monastic cell, here since the 7th century. Surveys of the later medieval period show that the tenants of the township of Pwllgwyngyll, as it was then known, held a total of 9 bovates of land from the Bishop of Bangor under the feudal system. A church was built during the medieval period and dedicated to Mary, probably under Norman influence: the building, later demolished and replaced by a Victorian-era church, was unusual in having a semi-circular apse, a feature more usually associated with cathedrals. Despite religious activity, the rural nature of the settlement meant that the parish had a population of only around 80 in 1563. Much of the land was absorbed into the Earldom of Uxbridge, which later became the Marquisate of Anglesey, and was subject to enclosures. In 1844, for example, 92% of the land in Llanfairpwll was owned by just three individuals. The population of the parish reached 385 by 1801. 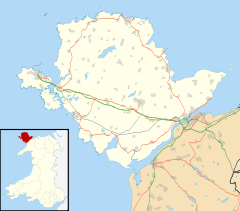 In 1826, Anglesey was connected to the rest of Wales by the construction of the Menai Suspension Bridge by Thomas Telford, and connected with London in 1850 with the building of the Britannia Bridge and the busy North Wales Coast railway line, which connected the rest of Great Britain to the ferry port of Holyhead. The old village, known as Pentre Uchaf ("upper village") was joined by new development around the railway station, which became known as Pentre Isaf, the "lower village". The first meeting of the Women's Institute took place in Llanfairpwll in 1915, and the movement (which began in Canada) then spread through the rest of the British Isles. The long form of the name is the longest place name in the United Kingdom and one of the longest in the world at 58 characters (51 "letters" since "ch" and "ll" are digraphs, and are treated as single letters in the Welsh language). Literally translated, the name means: [The] church of [St.] Mary (Llanfair) [of the] pool (pwll) of the white hazels (gwyn gyll) near [lit. "over against"] (go ger) the rapid whirlpool (y chwyrn drobwll) [and] the church of [St.] Tysilio (Llantysilio) of the red cave (-ogo[f] goch). The latter element has also been translated as "the cave of St Tysilio the Red". The parish, and village itself, was originally known as Llanfair Pwllgwyngyll: this form of the name is still often used. Pwllgwyngyll, "the pool of the white hazels", was the original name of the medieval township within whose boundaries the present-day village lies: Pwllgwyngyll was one of two townships making up the parish, the other being Treforion. Its name was first recorded as Piwllgunyl in an ecclesiastical valuation conducted in the 1250s for the Bishop of Norwich: the suffixing of the township name to that of the church would have served to distinguish the church from the many other sites dedicated to Mary in Wales. The parish name was recorded as Llanfair y Pwllgwyngyll (y = "(of) the") as far back as the mid 16th century, in Leland's Itinerary. Longer versions of the name are thought to have first been used in the 19th century in an attempt to develop the village as a commercial and tourist centre (see below). The village is, however, still signposted Llanfairpwllgwyngyll, marked on Ordnance Survey maps as Llanfair Pwllgwyngyll and the railway station is officially named Llanfairpwll, a form used by local residents. The name is also shortened to Llanfair PG, sufficient to distinguish it from other places in Wales called Llanfair. The long name was supposedly contrived in 1869 as an early publicity stunt to give the station the longest name of any railway station in Britain. According to Sir John Morris-Jones the name was created by a local tailor, whose name he did not confide, letting the secret die with him. This form of the name adds a reference to the whirlpool in the Menai Strait known as the Swellies and to the small chapel of St. Tysilio, located on a nearby island. The final -gogogoch ("red cave") is supposed to have been an addition inspired by the Cardiganshire parish of Llandysiliogogo, rather than by any local features. The true originator and date of the longer version of the name is less certain, however: an ecclesiastical directory published several years before the claimed renaming gives what it calls the "full" parish name in the slightly differing form of Llanfairpwllgwyngyllgogerbwlltysiliogogo ("St Mary's church of the pool of the white hazels over against the pool of St Tysilio Gogo [Tysilio of the cave]"), while exactly the same form appears in an paper on placenames published in 1849, its author noting that "the name was generally abridged" by locals. While the addition regarding the Swellies is supposed only to have been made in the 1860s, early 19th century guidebooks had already suggested a derivation of the element "pwllgwyngyll" from pwll, gwyn and gwyll ("gloomy raging pool"), in reference to the Swellies. The current postmark shows the name Llanfairpwllgwyngyll, but there are contemporary examples of the longer name seen below. The long name of the village is pronounced [ˌɬanvair­pʊɬˌɡwɨ̞ŋɡɨ̞ɬ­ɡɔˌɡɛrə­ˌχwərn­ˌdrɔbʊɬ­ˌɬan­təˌsɪljɔ­ˌɡɔɡɔ­ˈɡoːχ] ( listen). The ch is a voiceless uvular fricative [χ] or voiceless velar fricative as in "Bach" ([bax]: see ach-Laut) in most varieties of German. The ll is a voiceless lateral fricative [ɬ], a sound that does not occur in English. A few thousand local residents welcome about 200,000 visitors per year. The most popular attraction is the Llanfairpwll railway station that features the plate with the full name of the village. Other places of interest in the area include Anglesey Sea Zoo, Bryn Celli Ddu Burial Chamber, St Tysilio's Church, Menai Bridge, and Plas Cadnant Hidden Gardens. The name was submitted to Guinness World Records as the longest word to appear in a published cryptic crossword, having been used by compiler Roger Squires in 1979. The clue was "Giggling troll follows Clancy, Larry, Billy and Peggy who howl, wrongly disturbing a place in Wales (58)", where all but the last five words formed an anagram. The computer game Civilization V awards the "Longest. Name. Ever." Steam achievement to players for having a city named Llanfairpwllgwyngyll. John Lasarus Williams (1924–2004), known as John L, was a Welsh nationalist activist. ^ "Llanfairpwll Community Council". www.llanfairpwll.org. ^ "Check Browser Settings". statistics.gov.uk. Retrieved 31 March 2018. 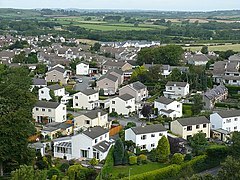 ^ "Llanfairpwllgwyngyll in Isle of Anglesey (Wales / Cymru)". Retrieved 10 April 2019. ^ "Community population and percentage of Welsh speakers". Retrieved 18 May 2015. ^ "Here's the story behind the 58-letter town name in Wales that everyone is talking about". Retrieved 18 September 2016. ^ "Llanfairpwll - History of the village". www.llanfairpwllgwyngyllgogerychwyrndrobwllllantysiliogogogoch.co.uk. Retrieved 16 May 2018. ^ Davies, E. (1959) Flintshire Place-names, University of Wales Press, p.141. "pwll - pool, pond, pit"
^ Melville Richards, "Place Names", in An Atlas of Anglesey (Anglesey Community Council. Llangefni, 1972). The late Professor Melville was one of Wales' leading authorities on place names. ^ Barnes, David (21 March 2005). "The Companion Guide to Wales". Companion Guides – via Google Books. ^ "Pronounced how?". History Extra. ^ "Llanfairpwllgwyngyll". Collins Dictionary. n.d. Retrieved 24 September 2014. ^ "Llanfairpwllgwyngyll". Retrieved 10 April 2019. ^ "Things to Do in Llanfairpwllgwyngyll‎". Retrieved 10 April 2019. ^ "Blog Archive » Guardian 25,102 / Rufus". Fifteensquared.net. 30 August 2010. Retrieved 28 May 2013. ^ "Steam Community :: Sid Meier's Civilization V :: Achievements". ^ a b c "Example climate estimate". Met Office. This page was last edited on 18 April 2019, at 22:45 (UTC).